When we shut our windows for extended periods of times during the heating and cooling seasons, indoor air is trapped in the home or office which collects pollutants that recirculate with other allergens and mold. As a consequence, indoor air can be five times more contaminated than outdoor air. Most air purifying methods, such as candles, sprays or ozone generators cover up odors and actually add additional chemicals to indoor air instead of purifying it. 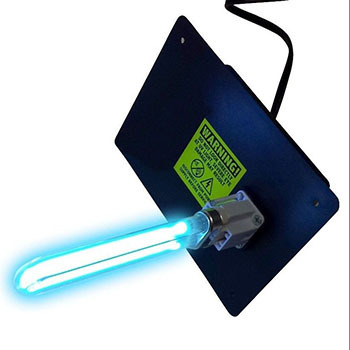 Affordable's UV-C germicidal light is safe, environmentally friendly and chemical-free. Microorganisms that cause sickness are penetrated by this light so that your indoor space is left with completely purified air in as little as 24 hours. This remarkable unit is available in the Rockford, Illinois area at Affordable Heating and Cooling. Our UV-C Germicidal light will remove any concerns you have over air quality issues. The UV-C light enters the cell walls of pollutants like bacteria, mold, and viruses so the DNA is disturbed and the cells become unproductive. The technology is so valuable because even though UV-C light is continuously produced by the sun, our ozone layer performs as a protective obstacle against the inflow of radiation. The benefit of using a Germicidal light is that indoor contaminants have are completely defenseless to the light. Also, UV Germicidal Lights remove Volatile Organic Compounds (VOCs) from the air. These are gasses that are released from substances like cleaning supplies, paint, pesticides and many other products that not only create offensive odors but also affect our health. The UV Germicidal light catches the VOCs and breaks down their compounds into harmless vapor and carbon dioxide. There is no other technology that is more effective at removing biological pollutants. APCO UV-C Germicidal lights also eliminate other foul odors in your home from pet dander, food, mold, dirty laundry and smoking resulting in a fresh and clean scent fresh air. The UV-C light also keeps components of your system free of waste materials and irritants, which contributes to improved heating and cooling efficiency. When your system is kept free of debris, HVAC systems with UV-C lighting have a longer life-cycle. The light is self-cleaning; after installation the only additional maintenance is a bulb replacement.